China’s Foreign Ministry explains why its vessels warned Philippine fishermen away from the disputed feature. As The Diplomat reported yesterday, Philippine media claim that Chinese Coast Guard vessels ousted Philippines fisherman from one of the features in the Spratly Island group, in the South China Sea. By doing so, China would have effectively gained control of Jackson Atoll, one of many features claimed by China as well as Taiwan, Vietnam, and the Philippines. A Philippine official later confirmed the reports to Reuters. Eugenio Bito-onon Jr., the mayor of Pagasa Island in the Spratlys, said that China had up to seven ships near Jackson Atoll to prevent Philippine fisherman from accessing the feature’s fishing grounds. The Philippines Foreign Ministry confirmed that Chinese coast guard vessels had been seen in the area previously, but said no vessels were present as of March 2. China’s own response to the story differed in the details, but did confirm the two major pieces: that China had sent government vessels to the feature (known as Wufang Jiao in Chinese) and that those vessels had warned away fishermen. Some points to note: First, according to Hong, China did not send Coast Guard vessels, as reported by the Philippine media, but sent salvage ships operating under the Ministry of Transport’s China Rescue and Salvage force (CRS). Like the Coast Guard, these are white-hulled boats, as opposed to the “grey hulls” of the Chinese navy, but the two organizations have separate functions. However, like the Chinese Coast Guard, an operation by the CRS presupposes – and demonstrates – Chinese sovereignty in the area. Towing away an abandoned vessel from Jackson Atoll may well be serving navigational safety, but it also functions as a demonstration of Chinese control and administration of a disputed feature. After all, the CRS mandate, per its website, is to respond “to marine accidents on Chinese waters” (emphasis added). Second, Hong acknowledged that the Chinese vessels had warned nearby fishing boats to stay away from the area, although he says that was a necessary step for safety reasons. That the warnings were due to a temporary safety measure was clearly not the impression the Philippines fisherman got. Bito-onon told Reuters that he suspected “The Chinese are trying to choke us by putting an imaginary checkpoint” on Jackson Atoll. 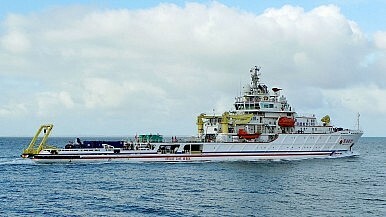 The main point that remains unclear is whether this is a temporary action – as would be implied from Hong’s explanation about the salvage operation – or a “new normal.” Despite all the tensions in the South China Sea, it’s rare for one claimant to seize control of a new feature – the previous example involved China ousting a Philippine navy vessel from Scarborough Shoal in 2012, and then denying Philippine fishermen from accessing the feature ever since. If China intends to permanently control access to the fishing grounds at Jackson Atoll, it will mean Beijing has, for the second time in four years, used coercion to increase its holdings in the South China Sea at the Philippines’ expense.